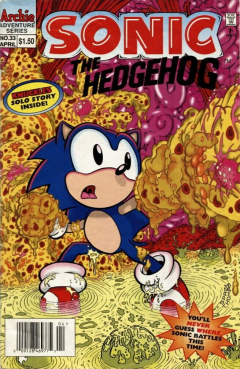 Sonic the Hedgehog 33 is the thirty-third issue of the Sonic the Hedgehog comic. This comic features two stories: "Let's Get Small" and "Sonic Shot" This issue also features the Knuckles' side-story "The Big Pictures", part 3 of the story. Sonic the Hedgehog has finished his latest mission and returns to Knothole Village via their secret trunk entrance. He confidently bounces off a tree in his dash and jumps into one of the Knothole buildings expecting a triumphant welcome. He skids to a halt as he finds that nobody is present, especially at the security monitoring station. He zips out of the building and looks around, noticing nobody is around. He calls out to anybody, but he gets no reply. Confused, he is approached, silently, by Rotor from behind, who throws a surgical mask over Sonic's face. Sonic is shocked at first, but turns around to see Rotor, who is very ill and disoriented. Sonic helps Rotor keep his balance, while they walk over to Rotor's lab so that he can explain what has happened. As they enter the lab, the sight of what Sonic sees shocks him so much that he lets go of Rotor, sending him tumbling to the ground. All the Freedom Fighters are bed-ridden and are deathly ill. Sonic wants answers, but Rotor is too disoriented. Sonic slaps Rotor slightly to bring him to, which works successfully. He points to a bag of smelly fast food that the group had ordered from a new fast food restaurant: McRobos. Sonic picks up the smelly, leaking bag of food, instantly recognizing it as a trap set up by Robotnik. He then asks why the group didn't eat what he left in the fridge. Unfortunately for Sonic, Rotor notes that the group has grown tired of his left-over chili dogs. Rotor then thinks back when they got the food, and that Robotnik must've put robotic germs on their french fries. He then notes that everybody else had succumbed to the virus, but he held out so he could warn Sonic. Right then, he passes out on the floor. Sonic heads over to Rotor's closet, deciding that the only way these robotic germs can be fought is at the microscopic level. After rummaging through lots of junk, he brings out the reduce/enlarge component of the roboticizer they destroyed some time back. He plugs the utility into Rotor's amplifier, for the best results. All set up, he flicks a switch on the component, activating it and shrinking him to microscopic size. The reduction process is a success, as Sonic looks in awe at Rotor's large tusks. Not wanting to waste any time, he zooms into Rotor's mouth to deal with their newest threat. As he goes deep into Rotor's throat, he is overcome with the strong stench of fish. Despite this pungent smell, he arrives at the inner systems crossroad, road signs that lead whomever is in the body to any part of the system. There are so many areas to go to, and Sonic has no idea where the germs could be located. Suddenly, a voice from nearby calls out to Sonic, telling him he can't do anything to stop the germs. He turns around and sees a granny-like version of Rotor who calls herself Auntie Bodies. Sonic notes that she is supposed to be fighting the germs, but she notes that the 'French Frirus' is too strong for her to fight. She also mentions that the other Auntie Bodies in the other Freedom Fighters also agree that they cannot fight this new germ. Despite this news, Sonic intends to save his friends. He runs past Auntie Bodies and prepares to enter the vital organs. As he enters the vital organs of Rotor, Sonic notices a number of green sores located all over the membrane wall around him. As he runs by, the sores pulsate and explode, covering him in puss. More of the sores remain, talking to Sonic and calling themselves the French Foreign Lesions. Before the remaining sores can do anything, Sonic gets up and enters a spin dash, removing all the sores from the membrane walls. He stands over all the destroyed lesions, thinking he has stopped the virus from spreading, but his troubles get worse as an unknown entity whacks Sonic with cane. It claims that he has only taken care of his bodyguards. Sonic gets up and sees a large virus with a French accent and clothes, calling itself Paris-Site, twirling it's cane around. Despite the hit with the cane, Sonic intends to continuing fighting, raising his fists to have a one-on-one battle with the virus. Paris-Site, however, has no intention of fighting personally. One of his henchmen, covered in fire, launches a burst of flames at Sonic, who jumps just in time to prevent getting burned. Paris-Site introduces his henchman personally, a flame-covered being called Fever. It launches another burst of flames at Sonic, who jumps away again using his Super Peel-Out technique. While using his peel-out, he launches at Fever and tries to punch him, but only ends up singeing his hand. As Sonic deals with the burn, Paris-Site walks up and prepares to take out Sonic with his cane. The virus' efforts, however, are stopped, as Auntie Bodies steps in and grabs his cane. Fever and Paris-Site react in fear as Auntie Bodies' confidence has returned after observing Sonic's brave acts. She uses the cane and destroys Paris-Site with a quick whack to the head. With the virus out of the way, Fever is more vulnerable. Sonic takes this opportunity and rapidly runs circles around Fever, putting the fire out. With the French Frirus destroyed, Auntie Bodies brings out her one-cellular phone and contacts the Auntie Bodies in the other Freedom Fighters and tells them what to do to destroy the virus. Slowly-but-surely, one-by-one, the Auntie Bodies in the other Freedom Fighters take care of the French Frirus with ease. As the virus is knocked out, the Freedom Fighters start to feel better. Rotor starts to feel well, causing his body to rumble. Auntie Bodies tells Sonic that he better get going. He is able to exit the body as Rotor starts to come to. He realizes, however, that he cannot reach the switch to enlarge himself. Being small, nobody will be able to hear him and he can be stepped on. He comes up with an idea and jumps into Rotor's nose as he starts to get him. Running around the nose, he tickles Rotor and causes him to sneeze. Rolling up, Sonic launches himself right at the switch and is able to move it by vibrating it. Sonic grows back to his normal size, just as Rotor fully comes to. The other Freedom Fighters get out of their beds as well, although groggy, feeling fine. He decides that they need some energy, so he zooms out to grab them some food. Fearing for the worst, chili dogs, they are surprised to see Sonic return with bowls of his auntie's secret recipe chicken soup. They all react in joy, despite the fact that the secret recipe is chili dogs. During Super Sonic vs Hyper Knuckles, continued from issue 32. Although the Chaotix and Knuckles think that Archimedes is leading the hand in their issues, little do they know is that there's a man above the man, as a caped being watches over Knuckles, Archimedes and the Chaotix. While watching his many monitors, he notes that the Chaotix and Knuckles do not understand the big picture. He could lead the way for Knuckles to find out, but he feels that this will prevent Knuckles from gaining wisdom that will help him improve himself. He decides not to help him find the way to the big picture, which Knuckles will be able to find at Mount Fate. With all the fighting against Robotnik, the Freedom Fighters decide to relax for a day with a game of ice hockey. Sonic and Antoine set up for the puck drop as Tails comes over. He drops the puck and Sonic beats Antoine to it, quickly manoeuvring around him while he complains. Sonic tells him to just enjoy the game, but Antoine gets more infuriated, as he's taking the game of hockey more serious. Sonic just ignores him and shoots at the goal, manned by Rotor. He deflects the puck, causing it to head out of bounds...right into the hand of a waiting SWATbot. The Freedom Fighters look over to see Snively and a squadron of SWATbots on the sidelines, only wanting a break from Robotnik's orders to enjoy a game of hockey. Sonic is sceptical about Snively's true intentions, but he tries to convince him that he only wants to have some fun. Stuck working for Robotnik, he works long hours, gets bad food, no fun and no games. Having witnessed the group playing hockey on his monitor, he just wanted to get out and have some fun. Sonic looks around, and is still not thoroughly convinced, but decides to play a game against Snively anyway. Snively and Sonic's team set up for the puck drop, with a SWATbot doing the job this time. The puck is dropped and the game is on...all the while, their game is still being played in Robotnik's lab. He takes notice of this, especially seeing Snively having fun, but he decides that this may give him an advantage, lulling the Freedom Fighters into a false sense of security. He grabs a microphone and calls out to the Freedom Fighters, stopping the game and surprising Snively. Robotnik ruins Snively's plan by offering a proposition: his team versus Sonic's team, winner-take-all. If they win, the Freedom Fighters can have freedom and peace. If they lose, they will be roboticized. If there is a tie, there will be overtime. Despite the extreme results with losing, Sonic accepts the deal. Sonic and a SWATbot set up for the puck drop. Snively comes over admits to Sonic that he had no part in the plan, and is rooting for him. Another SWATbot drops the puck, as the faceoff SWATbot easily beats Sonic to the puck and pushes Antoine aside. He calls for a penalty, but with the referee a SWATbot, his call for help is ignored. Tails plans to retaliate by tripping the SWATbot, but Sally tells him not to. Unfortunate for Tails, the SWATbot whacks him in the chin with its stick. With the Freedom Fighters out of the way, the SWATbot is set up for a breakaway. Rotor sets up for the SWATbot, but Sonic rushes in and grabs the puck. He weaves in and out of Robotnik's team and shoots for the goal. The puck goes through the SWATbot goalie's five-hole, winning the game for the Freedom Fighters. Robotnik slams his console and decides not to keep his end of the deal, but will allow the Freedom Fighters to walk away. Sonic, meanwhile, walks past Snively, who he notices is smiling. Snively notes that he is glad that Sonic won, so he see somebody stick it to Robotnik rather than himself. McRobo's is an obvious parody of the fast food restaurant McDonald's. The roboticizer Sonic mentions in "Let's Get Small" was shown in issue 3 and 4. Numerous body-related puns are mentioned in this issue, including Auntie Bodies (Antibodies) and Paris-Site (parasite). No letters from the readers are featured in Sonic-Grams. In the final page ad for Super Sonic vs Hyper Knuckles, the word 'yield' is spelled incorrectly as 'yeild' both times it is mentioned.